Thanks to YOU, we planted all 380 trees on EARTH DAY! 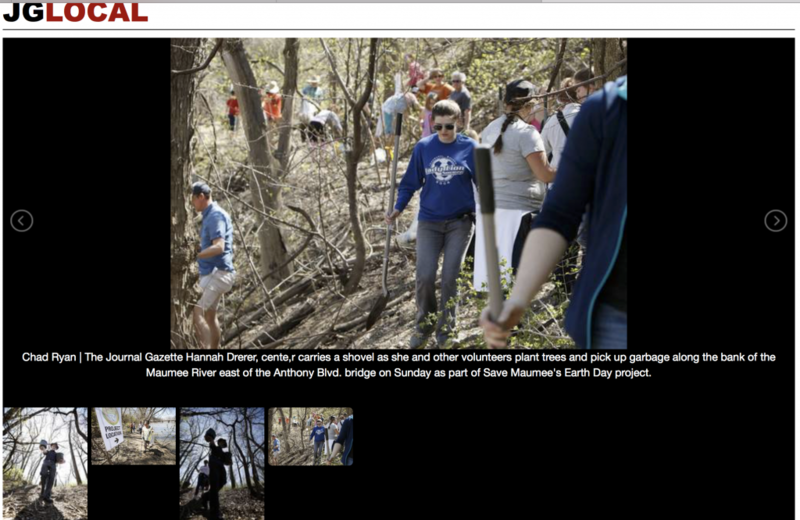 More than 250 people celebrated Earth Day by lending a hand in some way to hack away at the invasive Asian honeysuckle – easily spotted as the earliest green along the river – and to plant the 380 young trees along 1,000 linear feet of the Maumee River. The Earth Day event, at Wayne Street where it meets Glasgow Avenue and the railroad tracks near Dwenger Avenue on the city’s east side, was sponsored by Save Maumee Grassroots Organization. Money to buy the trees for this event and others this year and next came from a $50,000 federal grant from the U.S. Forest Service, said Lydia LaMont, Save Maumee’s president. 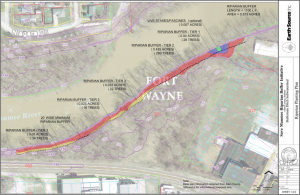 Save Maumee’s goal is to plant 1,390 trees this year. 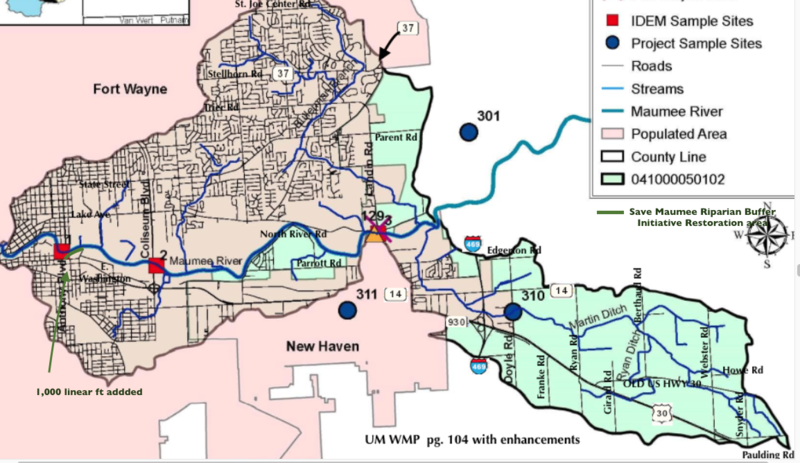 Adding about 400 trees trees Sunday will capture nearly 23,000 gallons of water each year that will reduce flooding elsewhere, according to information distributed at the event. “Kids used to think it was hilarious to roll them through the bridge,” Allen said. The new bridge on South Anthony Boulevard doesn’t allow that, he added. Allen also planted trees. “She really means what she says,” Clark said of Frost-King whom she met at IPFW. Earth Day has always been Save Maumee’s largest event! Are you looking for an adventure. Looking for something that is not the “average day?” COME FIND US! 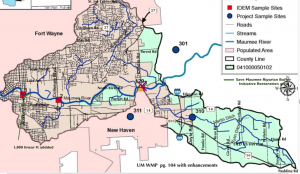 Save Maumee likes to do work where others cannot easily see progress, but know we always have water quality improvements in mind! FREE EVENT, but you may want to bring your checkbook for added fun for the whole family! The trees we plant here will be dedicated to Indiana’s Bicentennial #treeofhope project! Lucky Harley Davidson ride through to support Nature Conservancy’s efforts to plant 1 Billion Trees! 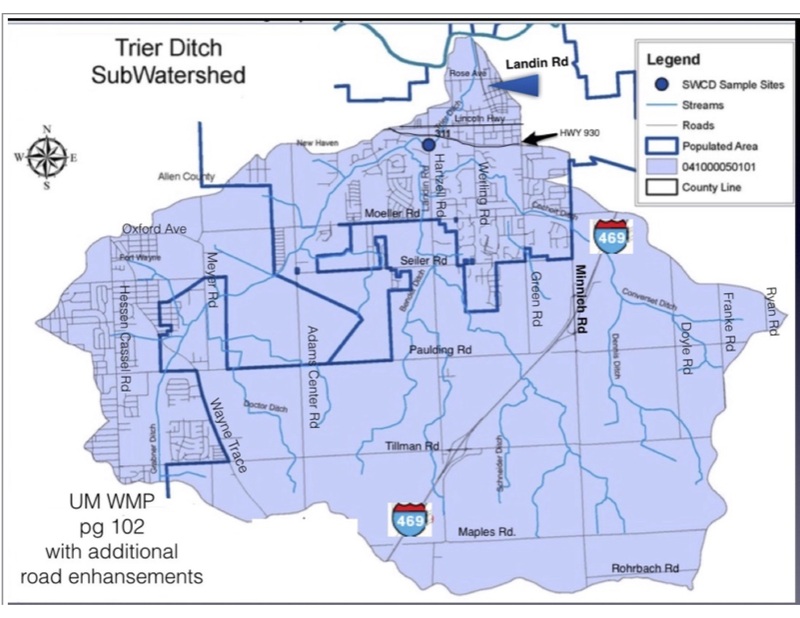 Save Maumee Riparian Buffer Initiative will be planing 1,390 trees in the drainage areas of the Maumee that are considered “most impaired,” according to the Upper Maumee Watershed Management Plan. 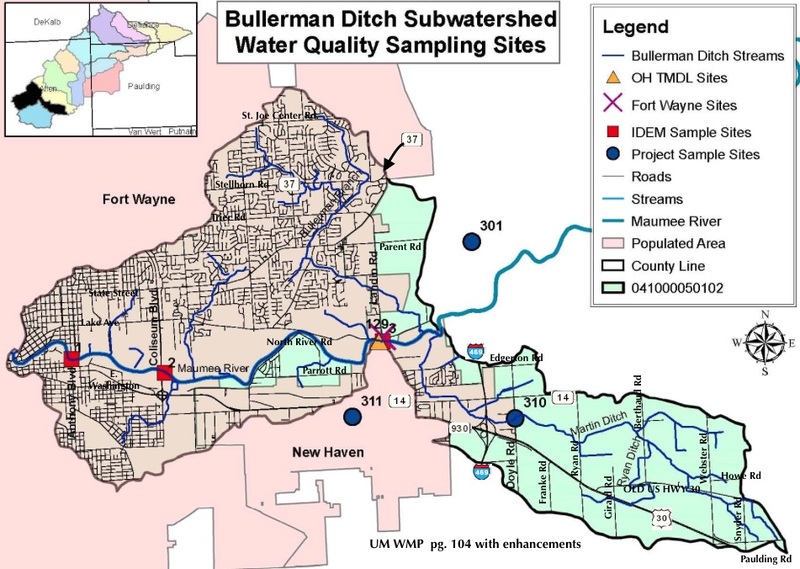 Bullerman Ditch Subwatershed is Earth Day’s project area for 2016! 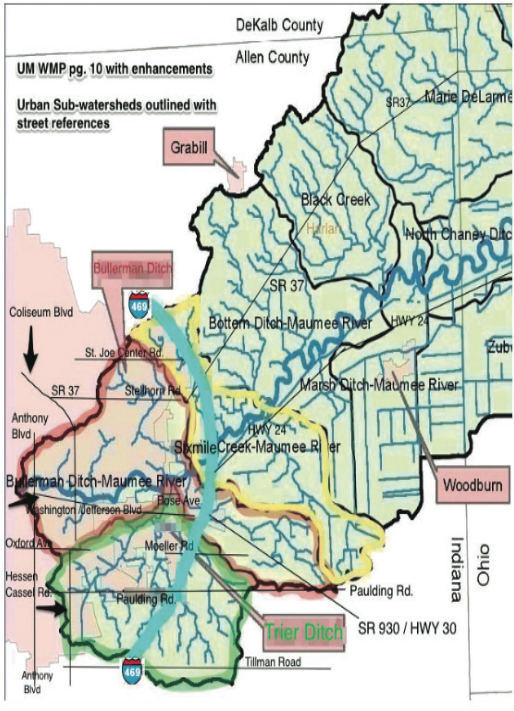 See if we will be working in your watershed! 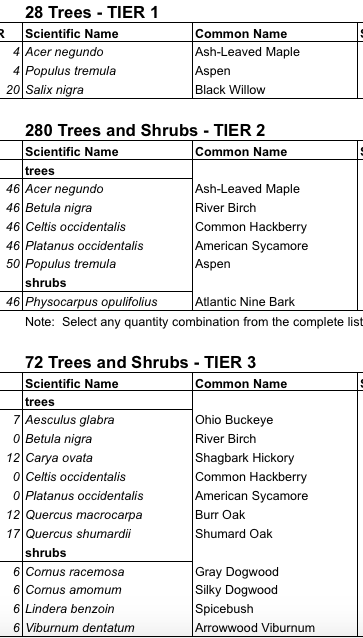 SEE trees we will be planting over 2016-2017 planting season. 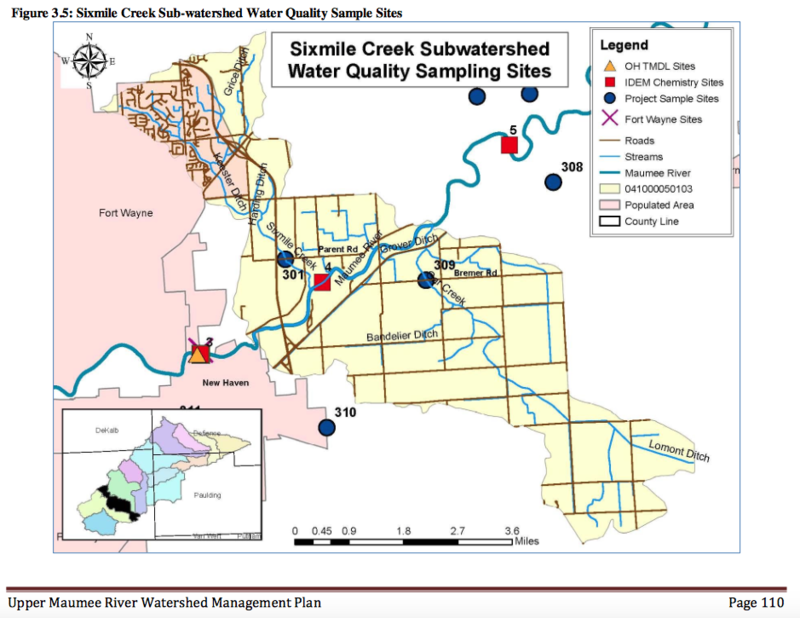 This is our first project that will be completed through the federal Great Lakes Restoration Initiative (GRLI) and U.S. Forest Service grant. Save Maumee and the USDA are equal opportunity providers, employers, and lenders. CLICK HERE for full nondiscriminatory policy.